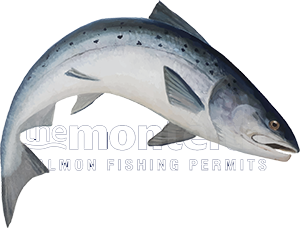 One of the most common salmon take hindering factors I see is the inability of many salmon anglers to change down to the smallest of salmon flies during the warm low water levels of Summer. Even though bigger flies work well during other times of the fishing season the low water Summer months often require a completely different approach. While fishing the Summer months during very low warm water conditions often it's only the tiniest of fly that will stand you a real chance of an offer. That doesn't mean that bigger flies won't work but often it's only the tiniest of salmon fly tied on a size 16 or 18 that an 'educated' resident Summer salmon will have the inclination to investigate and the only way it can do that is with its mouth! In saying that if there's been recent water and the river is in good order a normal dressed Summer size 11 would be about right. Whether salmon view in the UV spectrum or can adjust to IR vision as suggested by science I'm sure they are no different from ourselves when noticing subtle movement the same way we'd notice a tiny mosquito as it passes through our peripheral vision. Most species require acute vision for survival so don't think for one second that a salmon that can successfully hunt in the deep dark waters of the Atlantic Ocean won't clearly see the tiniest of salmon fly offerings regardless of the prevailing light conditions or even in mildly coloured water for that matter. Personally I cannot see past a tiny version of the Silver Stoat when the going is tough and you're under pressure to pull a rabbit out of the hat! A few short strands of wing material and light hackle is all you need during many low Summer salmon fishing scenarios and even though you'll be tempted to fish a heavier dressed fly you must resist that temptation. After you've hooked a few fish in difficult Summer fishing conditions on these tiny 'trout flies' your faith levels will be sufficient to understand the full power of Summer salmon fly subtlety. In saying that make sure the tiny fly hook you're using is strong enough to handle the strain of a heavyweight should one appear!